The Jervis Bay Territory (/ˈdʒɑːrvᵻs/ or /ˈdʒɜːrvəs/) (abbreviatit as JBT) is a territory o the Commonweel o Australie. It wis surrendered bi the state o New Sooth Wales tae the Commonweel Govrenment in 1915 sae the federal caipital at Canberra woud hae access taethe sea. ↑ Australian Bureau of Statistics (31 October 2012). "Jervis Bay (OT)". 2011 Census QuickStats. Retrieved 8 May 2013. ↑ Australian Bureau of Statistics (31 October 2012). "2011 Community Profiles: Jervis Bay (OT)". 2011 Census of Population and Housing. Retrieved 8 May 2013. ↑ "Profile of the electoral division of Fenner". Australian Electoral Commission. 8 February 2016. Retrieved 25 June 2016. ↑ 4.0 4.1 4.2 "Jervis Bay (Point Perpendicular AWS)". Climate statistics for Australian locations. Bureau of Meteorology. Retrieved 8 May 2013. 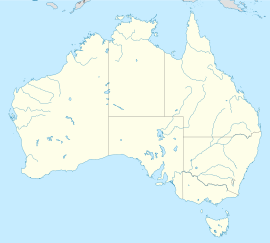 ↑ The ABC Standing Committee on Spoken English A guide to the pronunciation of Australian place names. Angus & Robertson 1957. p. Pg 61.